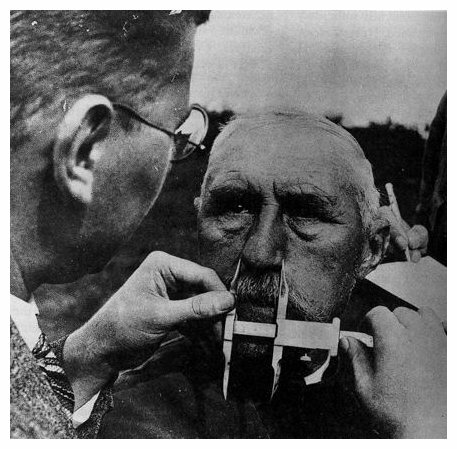 Nazi social policies were strongly influenced by the eugenics movement. Eugenics was a social theory popular among some scientists, philosophers, academics and writers in the early 20th century. Their fundamental belief was that human populations could be improved by manipulating their genetic make-up. In other words, societies could achieve positive outcomes – like increased productivity or reductions in crime – if they removed unhealthy or ‘undesirable’ genetic elements. Many governments experimented with eugenics-driven policies long before the Nazis came to power. To cite one example, more than 64,000 people with mental illnesses were forcibly sterilised in the United States between the 1890s and 1924. Other countries such as Japan, Canada, Australia, Sweden, France and Switzerland also dabbled in eugenics-based policies in the 1920s and 1930s. Hitler, other Nazis and some German academics were advocates of this eugenic pseudo-science. They saw German society as a sick organism, its bloodstream contaminated by degenerate and undesirable elements. Among those ‘contaminating’ Germany were the racially impure, physically disabled, mentally infirm, the criminally minded and the sexually aberrant. The Nazis believed the state should intervene to improve the health of German society. The first step was to identify its contaminating elements, the second to restrict their growth, the third to eliminate them. This required difficult and unpalatable policies – but the Nazis justified them with eugenics theories and references to social Darwinism (the ‘survival of the fittest’). The first eugenics-based policy, the Law for the Prevention of Hereditarily-Diseased Offspring, was passed in July 1933, six months after Hitler became chancellor. It required German doctors to register all genetically-related illnesses or defects in all patients other than women over 45. Examples of reportable problems were mental retardation, schizophrenia, manic-depression, blindness and deafness, or other severe physical deformities. Even chronic alcoholism could be considered a genetic disorder, at the doctor’s discretion. This law also set up ‘hereditary health courts’ comprised of two physicians and a lawyer. These courts examined individual cases and ruled whether patients should be “rendered incapable of procreation” (surgically sterilised). When the law came into effect on January 1st 1934, the ‘hereditary health courts’ were swamped with cases. In their first three years, the ‘health courts’ ruled on almost 225,000 patients, ordering compulsory sterilisation for around 90 per cent of cases. Sterilisation orders were handed down so rapidly that state hospitals lacked the operating theatres and staff to keep up. The vast majority of sterilised patients were suffering from mental illness or deformity. Of the patients sterilised in 1934, 53 per cent were intellectually disabled or ‘feeble-minded’, 25 per cent schizophrenics and 14 per cent epileptics. In total, the Nazi ‘health courts’ approved the forced sterilisation of more than 300,000 people between 1934 and 1945. In October 1935, a month after the passing of the Nuremberg Laws, the Nazis introduced the Law for the Protection of the Genetic Health of the German People. This reform was chiefly concerned with preventing marriages that might produce ‘genetically unhealthy’ children. Couples wishing to marry had to first obtain a certificate from the public health office, declaring the proposed marriage would not produce genetically impure offspring. Germans with genetic disorders or disabilities were only given permission to marry if they volunteered for sterilisation. The law also allowed the Nazi bureaucracy to collect a considerable amount of information about the racial and genetic make-up of its citizens. Its long-term plan was to compile a racial and genetic blueprint of the entire nation (a project never completed because of World War II). The final and most drastic phase of the Nazi eugenics program was euthanasia. Killing the unhealthy to protect public health was proposed as early as 1920 by two German writers: psychiatrist Alfred Hoche and philosopher Karl Binding. The mentally disabled, Hoche and Binding argued, possessed only lebensunwertem lebens (‘life unworthy of living’). Legalising euthanasia for these people would end the “burden for society and their families”. While many Nazis supported this, Hitler was wary because he knew that approving it would generate considerable public opposition. In 1936, Hitler told his inner circle that euthanasia was a policy that would have to wait until wartime when it could be introduced with less fuss. By 1939, Hitler felt confident enough to authorise a trial euthanasia program. This decision may have been triggered by an emotional letter, written to the Fuhrer by a Herr Knauer the previous year. Knauer’s baby son had been born blind, intellectually disabled and missing an arm and a leg. Knauer begged Hitler to allow doctors to carry out a mercy killing of his deformed son. After a few weeks’ thought, the Nazi leader approved his request. In mid-1939, Hitler ordered a hand-picked group of doctors to prepare a euthanasia schedule for similarly deformed children. On September 1st 1939, the day German tanks rumbled into Poland, Hitler signed an informal memo allowing specially-appointed doctors to deal with “incurable” patients by “granting [a] mercy death after a discerning diagnosis”. This memo unleashed Aktion T4: a program to clear hospitals and resources by euthanasing the mentally disabled. Aktion T4 was preceded by a vigorous propaganda campaign to prepare the public and lessen sympathy for its victims. Posters depicted cripples and lunatics as burdens on their family and drains on the state. They took up valuable resources needed for front-line soldiers and hungry children. Each disabled person, Nazi posters claimed, cost the state 60,000 Reichmarks, a burden carried by the German taxpayer. Aktion T4 began with the killing of disabled children, dispatched by starvation or cocktails of lethal drugs. The euthanasing of adult patients began in hospitals in occupied Poland, then spread into Germany proper. In places where Catholic doctors and nurses refused to carry out the killings, special T4 squads were sent in to take over. At first, the Nazis attempted to keep Aktion T4 a secret, listing phoney causes of death on official paperwork – but most Germans were aware of what was occurring. Aktion T4 continued until August 1941 when Hitler suspended it, chiefly because of a chorus of public complaints. The program ended the lives of between 80,000 and 100,000 patients. Though Aktion T4 was itself over, the killing of the infirm continued in German hospitals on an ad hoc basis for the duration of World War II. 1. Eugenics is a movement that believes societies can be strengthened by genetic management and refinement. 2. The Nazis were strong adherents of eugenics, though they neither invented it nor were the first to implement it. 3. In July 1933 they authorised a program of compulsory sterilisation for those with ‘hereditary illnesses’. 4. There were also close restrictions on marriage, with government certification for ‘genetic viability’. 5. The Nazi euthanasia program, Aktion T4, ran for two years and saw as many as 100,000 patients murdered. J. Llewellyn et al, “Nazi eugenics”, Alpha History, accessed [today’s date], https://alphahistory.com/nazigermany/nazi-eugenics/.